It begins where the Rhymney river divides Monmouthshire from Glamorganshire; it ends where the Llwchwr forms the border stream of Carmarthenshire, and stretches northward to the base of the mountain ranges that divide the Vale from those districts known as "the hills". Travellers by the Great Western Railway pass through the whole length of the Vale, but they only get glimpses of the beautiful pasture-lands that fringe the Severn Sea. From Cardiff to Carmarthen the route taken by the railway is, in some places, very picturesque; but seaward of that line, where, as yet, the shrill whistle of the engine has not been heard, there are charming nooks and secluded places which, to the town-dweller, look like dreamland. The shore-line presents scenes of varied beauty, and the country around it is undulating rather than hilly, with glens and valleys sloping to the sea. 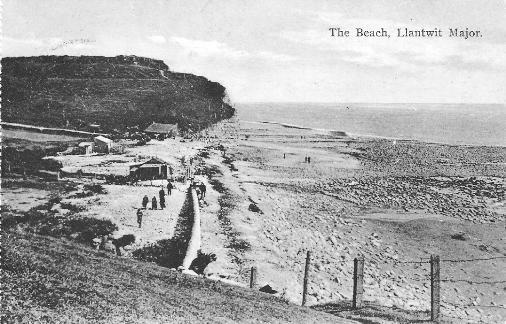 The sea-board of Glamorgan extends for nearly ninety miles, of which fifty miles are very bold and bluff, the remainder being for the greatest part flat and sandy. The cliffs range between fifty and one hundred and twenty feet in height, and the boldest of these are between Penarth Head, near Cardiff, and Barry Island, then again near Fontegary and Porthkerry, after which they are of no great height for several miles, the next rise being in the romantic neighbourhoods of St. Donat's, Marcross, near the Nash Sands, thence on to Dunraven and Southerdown. Westward of the river Ogmore there are long stretches of sand hills, broken for a short distance by the grim and dangerous rocks and crags of Sker, and thence to Swansea, the land is flat and sandy, but afterwards the cliffs increase in height through Gower to the utmost limits of the country. All thse districts are almost unknown to the tourist, for the reason that they are difficult of access, and the accommodation is of a limited and in some instances a humble kind. Small towns, villages, and hamlets, all very pretty, are to be seen throughout the Vale of Glamorgan, and often there are many miles between solitary farm-houses along the coast.